Recently authorities were called into an El Cajon residence where they found 78 dogs living in less than desirable conditions. This is animal hoarding that puts the dogs, the residents and the entire neighborhood at risk for major health problems. Thankfully, the story had a happy ending as the 78 dogs were removed, given medical care and put up for adoption. This is a prime example of hoarding and clutter that has gotten out of control. 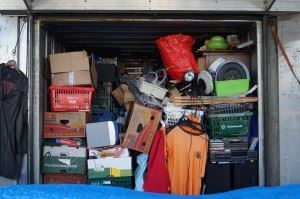 Hopefully, your clutter situation is nowhere near as extreme but even if it is one call to Junk King Contra Costa can have it all removed. In extreme cleanup situations, Junk King Contra Costa will dispatch multiple teams and trucks to a location. Their goal is to get everything cleared out in a single session. One of their standard two-man moving crews, easily handles the typical junk removal session. When you call to set up your appointment with Junk King Contra Costa, you can tell them whether or not they’ll be dealing with a few items or a hoarder situation. In either scenario, you should be embarrassed about asking for help. Junk King Contra Costa is all about problem solving and making sure your junk is gone as quickly as possible. Although many people think of clutter as junk mail and old magazines laying around the living room it really can be just about anything that is no longer serving is useful purpose. It could be an old recliner that no one sits in or sofa out in the garage. Clutter can be a broken refrigerator on the back porch or boxes of clothing that you want to donate. All of that can be turned over to Junk King Contra Costa for fast removal. One of the many benefits of hiring these professional junk haulers is that your stuff is not going to be automatically trashed. Junk King Contra Costa never likes to see anything go to waste. The crews of been trained to spot those things that could be of use to a charity. There is also a whole bunch of recycling that could happen with some of your items even old furniture. You might have been collecting clutter for long time but it only takes one session with Junk King Contra Costa to make it all disappear. This entry was posted in Junk Removal and tagged clutter, Junk King, junk removal on December 31, 2016 by Krishna Vepa. Last updated August 17, 2017 .